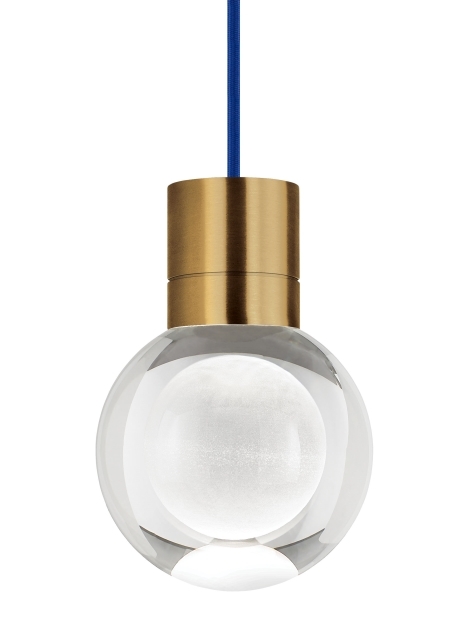 The Mina pendant light from Tech Lighting features an elegant sphere of pure optic crystal. This beautiful floating orb is laser-etched and further illuminated by a powerful downward-firing LED hidden within the socket. Although smaller in diameter, the Mina brilliantly provides a bounty of task light onto surfaces below. Highly customizable, the Mina pendant features 8 cord colors and three on-trend finish options. The Mina ships with your choice of fully dimmable LED lamping. In addition to the wide range of customizable options, the Mina pendant also comes with two complementary accessory options. Swag Hooks and the Locus accessory. Due to its contemporary yet raw style, the Mina can be used in a range of consumer and commercial lighting applications.